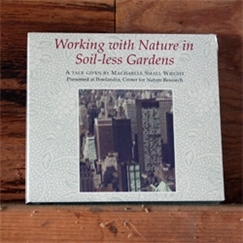 DVD: Working with Nature in Soil-less Gardens - Perelandra Ltd.
Machaelle teaches how to apply the principles of co-creative science to every aspect of your life: business, education, the arts, the home, your job, projects and goals — all those gardens in life that are not rooted in soil. This is a fascinating, dynamic and humorous talk given by Machaelle Wright for those who wish to apply the principles of co-creative science to every aspect of their lives: business, education, the arts, the home, research, your job, personal and professional projects and goals . . . all those gardens in life that are not rooted in soil. By the end of this talk, you will know exactly how to work with nature to achieve any goal you wish with extraordinary efficiency — and balance. on 3/27/2011 Refreshingly direct and amusing description of our role in creative process. My husband & I watched this together. I have the accompanying book. I found both the book & the DVD mutually supportive of the other. We found Machaelle's analogies and humorous stories really illustrated the basic principles of conscious creating. And, we laughed often as we watched it - which is much appreciated!